With Album Turbo Design all album data and the designed sheets are saved into a file with extension .db (database file). Therefore creating a new album means you have to create also a new database file for it and opening an album already made means you have to select the database file for this album. IMPORTANT: The pictures are saved at low resolution in the album database file and you may design sheets with them but you won’t be able to generate final files if you have deleted, renamed or moved the picture files from their original path. 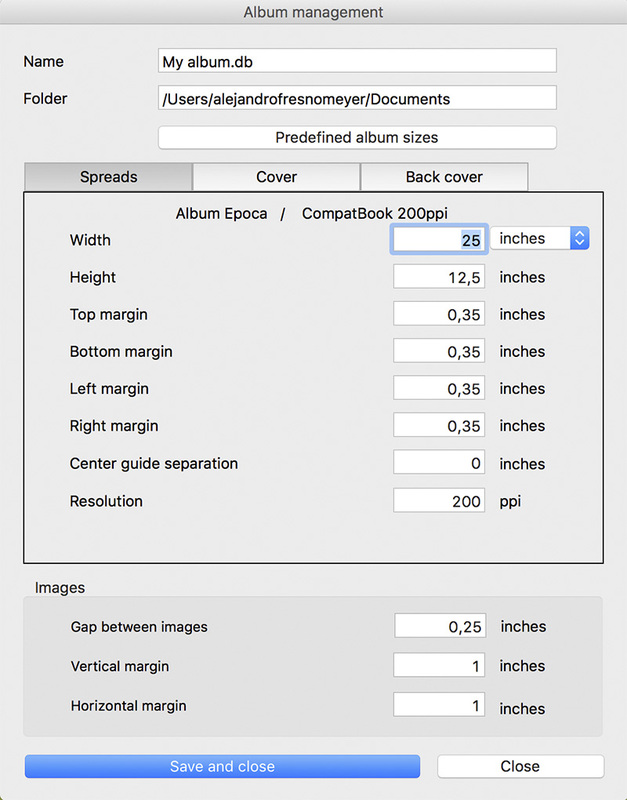 Input the album size, width and height must include the album margins for the binder (please ask your laboratory ). Margins are only a visual help while designing the sheet. Input the sizes for the cover and back. If you have selected a predefined size then usually this sizes are filled automatically. You may also input a default gap between images and the vertical / horizontal design margin for all spreads, please notice that this is a design margin and doesn’t need to be same as safe area margin. Finally please click at “Save and close”. Each time you start a new album the pictures list will be empty and one new sheet will be added to the design area. You may modify the current album size by selecting “Edit album” from the main menu. Just input new sizes and all sheets will be redesigned automatically. You may also create a copy of the album with this option, input a new album / file name at top and if needed select a target folder, the application will create a copy of the album database and in case you have changed the sizes all sheets will be redesigned accordingly.